Oh my head hurts. I was up till 11pm last night watching the finale of Lost while also trying to watch the last hour of American Idol. do not read if you haven’t watched last night’s episode!!! Who else’s head is spinning? 1. Why did Charlie die? Couldn’t he have just ran out, let the looking glass flood and swim out? Or shut the door behind him? Here’s my beef— I would have rather seen Charlie die LAST week than this week. Because last week was just so tear-jerky and it would have been a better send off for Charlie. 2. WTF was up with that ending? I had an inkling early on into the episode that something was very odd about Jack’s “flashback”? Are the remaining three seasons going to show “flash forwards?” or are they just focusing on what happens after they are rescued. Something tells me that Ben knew what he was talking about. I am fearful that all of my favorite characters are going to turn out BAD if that is the way it’s going. Also, Kate alluded to she was with a man, Sawyer? 3. Was that really Walt, or imaginary Walt? 4. I LOVED the scene where Hurley ran over the bad guys. And of course, that Sayid and Jin weren’t shot after all. 5. Who was in the coffin? I am thinking Ben. 6. Did it seem to you that Jack alluded to the fact that his Dad was still alive in the flash-forward??? What the heck? 7. What’s up with Naomi, is she bad….. and what about Penny??? Where the heck was she if not on the boat? 8. I am not into violence (don’t get me wrong), but I LOVED when Jack beat the living sh*t out of Ben. The grand manipulator was finally put in his place. I am more confused than ever. And I loved the episode. 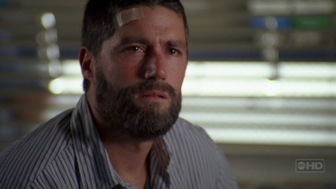 I just hope that this show isn’t going towards the dark-side of Lost. Is this a space-time continuum storyline or are we know going to focus on what happened to the Losties after rescue??? And we have to wait until January, 2008 for more answers? arrgh! I thought it might be Locke in the coffin. Don’t know though. It was such a great season finale! I kinda think Jack’s father is still alive, too. Juliet in the coffin? Hmm. I was thinking Ben. Nobody went to the viewing, afterall. Hmm. That gets me thinking. I like the idea of flash forwards ~ COOL!Poor Jack, though. Totally whacked-out individual. Ok, I was all wacked out from Lost as well (and I also tried to watch the end of American Idol at the same time!). Hubby and I can’t stop talking about Lost since last night. We think it was JULIET in the coffin. Possibly.And could it be that this flash-forward show is wrapped up in Desmond’s constantly “visions?” Could this be real? A vision? Maybe they got off the island, and maybe they didn’t. We shall see, in a few LONG MONTHS! I definitely think we’re getting into a weird space-time continuum thing. It’s totally making my head hurt!